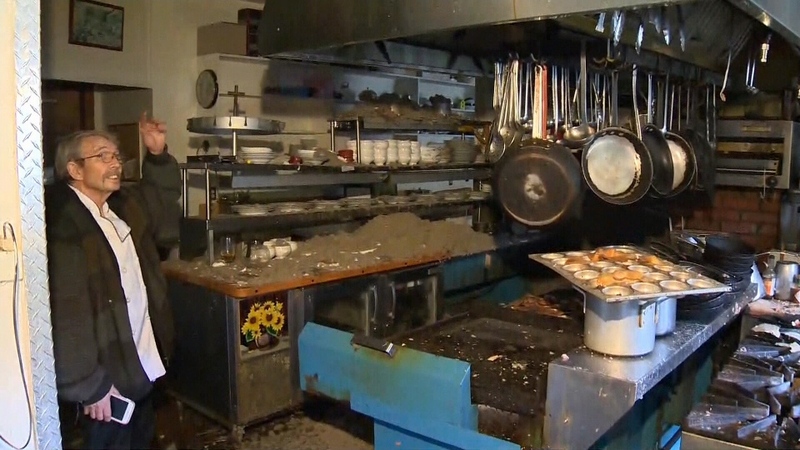 A beloved restaurant on the Saanich Peninsula was severely damaged by a fire that started in an oven and rapidly spread to the rest of the building, according to the owner. Deep Cove Chalet, known for its fine French dining and waterfront location, sustained significant damage after fire broke out just before 11 p.m. Saturday. North Saanich Fire Department arrived at the restaurant to find heavy smoke pouring from the roof and called in mutual aid from Sidney and Central Saanich. "After chasing the fire through many void spaces it was finally extinguished with minimal damage to the structure," the fire department said a Facebook post. While the cause of the blaze remains under investigation, the eatery's owner says he believes something overheated in an oven and caught fire before spreading up through a vent. Staff used an extinguisher to try to put out the blaze until firefighters arrived. Owner Pierre Koffel says fortunately no one was injured, but it's hard to see his cherished restaurant so severely damaged. "I have to say, you feel sort of empty. At the moment, we're hoping for the best, talking to all the supporters and everybody," said Koffel. "We'll rebuild as soon as we can, as soon as the formalities are done with, and open when we can." Koffel said community members have shared their condolences through visits, phone calls and emails. It's too early to say how long repairs to the establishments may take, but Koffel said he is committed to reopening.